The international oil market is volatile; prices vary constantly due to supply and demand and political instability, as demonstrated in the Middle East during the last few years. This leads the oil companies and more especially the oil refiners to try to minimize their running cost, not just by way of increasing refining efficiency, but to try to minimize transportation cost. One of the biggest problems is caused by tank outage during the tank cleaning process. This can be a very long time, using conventional methods, therefore, tank outage is a big issue and of great concern to refinery managers and product storage/transport managers alike. 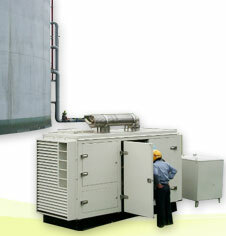 As an example of typical costs involved, consider one 100,000 KL crude oil storage tank. During operation it is likely to build up 4,000 to 5,000 KL of oil sludge within 5 years. It will take up to 1 2 0 days for conventional tank cleaning to be completed, so the tank outage could be 4 months out of every 60 months = 6.7%, that is to say, the tank outage is 6.7% between 2-tank cleaning operations. USD18, 870,000 * 0.067 = USD. 1, 2 64, 2 90. In the event that the market price of oil is constantly increasing, the losses due to tank outage would be even greater.